Zio didn’t plan that we would be dining in a Bangladeshi restaurant at the same time that nation was suffering from the effects of a deadly cyclone; that we would be stuffing our respective faces while many Bangladeshi people were without food and water. It was just one of those ironic coincidences. Would the circumstances induce guilt and inhibit our appetite? The family that ran Spicy Mina, including sari-attired Mina herself, certainly hoped not. There were only two other customers, Bangladeshi men chatting over tea, in the small restaurant located on an isolated portion of Broadway in Woodside the night we were there. We were all assembled on time except Rick, who seems to enjoy making a grand entrance midway through our appetizers. This time, however, Rick checked in via cell phone to say he was stuck in traffic on the BQE and to start without him as if we might actually consider waiting. 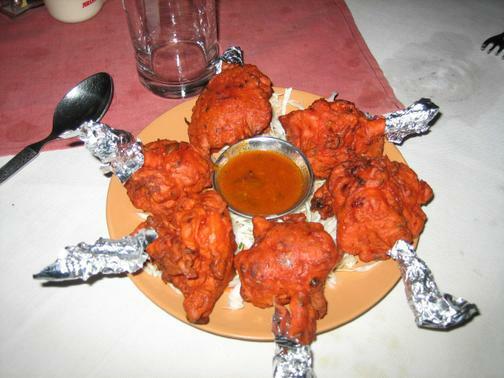 But with the arrival of the appetizers, a gamey lamb dish in a thick stew called haleem, something that looked like puff pastry filled with ground chick peas, called alur chop, and “loly-pop” chicken, the Bangladeshi-version of the Buffalo chicken wing, Rick wasn’t missing much. But we just couldn’t wait any longer. Eugene was merciless: “The BQE is a block away!” he intoned in his typically brash manner. And Zio was restless—the promise of “mastard” (sic) fish, had him anxiously chugging diet Coke’s. So we ordered without Rick, but included a dish for him—something he would appreciate, fish kofta curry, or as explained in the menu: fish balls. Mike from Yonkers, suffering from a gravely throat, thought the palak paneer might offer relief but when it arrived it look different than any paneer I’ve ever seen; the spinach shredded spinach with crumbly, feta-like pieces of cheese, along with a few whole dried chilies. The taste was something reminiscent, according to Eugene, to broccoli rabe, and I couldn’t disagree; there was definitely an Italian flavor to it. Gerry’s idea of relief was a vindaloo, specifically lamb and Mina’s version was fiery in a light, oily sauce, again nothing like your cookie-cutter variety vindaloo. The dal fry Mina special, mung daal in special spices was a nice accompaniment to the nan and roti bread we ordered, while the chicken tikka masala, in a rich, creamy yet spicy sauce had Eugene swooning, which, to be honest, was not a pretty sight. 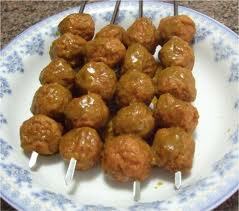 The fish balls arrived just as Rick called again, this time to say he was still stuck on the BQE in the vicinity of the legendary Kosciuszko Bridge and was aborting any further attempts to try to make it to Spicy Mina’s. And though we ordered for six and now we were only five, the fish balls, light and with just the faintest hint of fish, were made short work of. The waiter slowly cleared our table, allowing Zio sufficient time to scour the remains of the whole fish searching for any stray pieces of edible flesh that might have escaped our intense scrutiny. It was unanimous; the fare at Spicy Mina’s was nothing like the $7.95 Indian buffets we were used to gorging ourselves on. By the time the waiter returned with complimentary half-orders of rose water-accented rice pudding—perfect to cleanse our over-spiced palates—any guilty thoughts about the human suffering in Bangladesh that any of us might have had going into Spicy Mina’s was completely forgotten. But why then do I feel guilty about that? 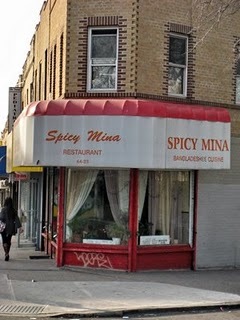 Unfortunately, Spicy Mina didn’t survive the recessionary cyclone that ravaged many small business in New York the following year and persists today.